Thirty-two years ago today, I was baptized by Elder Arturo A. Tolentino, a full-time missionary from Quezon City as a convert and confirmed by Elder Daniel Crossley, a full-time missionary from Salt Lake, Utah as a member of The Church of Jesus Christ of Latter-day Saints. In this long years of membership, I was able to tackle and hurdle various trials and challenges in my life as I nurture and nourish my membership in the Church by staying faithful and active in my various callings I received. In this first Sunday of April which is our fast and testimony Sunday, I was rehearsing and talking to my mind of what the achievements I had had before I shared my testimony. 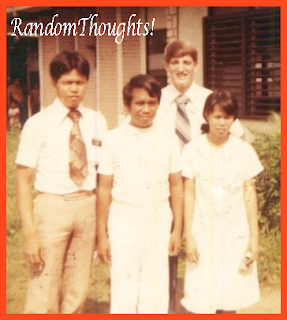 Memorable things flashed back in my mind from the time of my conversion which took me 6 years till the time that my family members, my wife and I were sealed in Manila Philippines Temple, Quezon City. What Should I Report to Our Father in Heaven? By my example and being obedient to the ordinances and principles of the Gospel I was able to baptize my wife and 6 children and confirmed as members of the Church. I was able to confer upon my two sons, Dondon and Toto Jun the Aaronic and Melchizedek priesthood as they reached their qualified age an authority coming from God. I was able to receive numerous Church callings like teachers in Sunday school classes, Priesthood class, Seminary and Religion of Institute teacher which I was able to magnify them. As the first counselor in the Bishopric to the late Bishop Joaquin Villarias, I was able to spiritually strengthen the members under our ward and perfectly sustained Bishop Villarias as a Bishop. Also I supported the missionary work of the ward in bringing more converts and other retention and reactivation program of the ward. Strengthening the spiritual well-being of my family, I conducted a regular family home evening, bringing them to the Church every Sunday and more importantly bringing them together to the Manila Philippines Temple for sealing for time and eternity. Also I did proxy baptism for the dead of my late parents and ancestors. Leading my family in reading the scriptures like the Book of Mormon, the Bible, the Doctrine and Covenants, and Pear of Great Price, I was able to edify and strengthen them to develop their own respective testimonies. By paying my tithes and offerings regularly, I led them as an example of an obedient head of the family. By living the scriptures to the way I live and doing service to my fellow beings, I instilled them the value of a soul in finding it back to the fold of our Father in Heaven. Thus, I was able to send my son, Gilbor Junior to mission for 2 years in Butuan Philippines Mission. 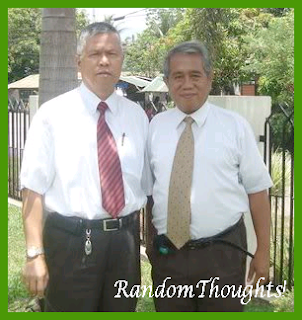 With honor and dignity, he went home imbued with spiritual happiness and satisfaction for completing a mission. I also got various trials and challenges in any form that I couldn't resist, but patience and love of God, I was able to overcome them. Father, these are the things that I could report to you as of now. I do still have more things to accomplish. Please guide me and lead me the way I should go. I entrust to you my life and my family too. I know you won't forsake us or charge us beyond our capacity to bear. I know you do love us. I know you've given me sickness in which my faith in you will be strengthened. You've given me problems to make use of my resourcefulness and wisdom for good. My faith makes my weaknesses strong and I do inspire to do well good for Christ's sake. Forgive me of my inadequacy. 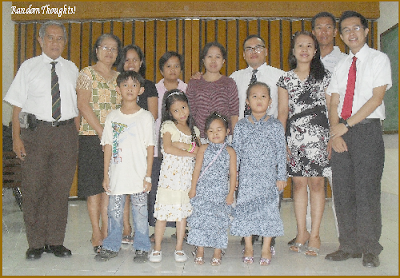 Out of those spiritual achievement I made for 32 years as a member of the Church, I consider the greatest accomplishment I have had is when I bring all of my family members to the temple of the Lord for family sealing and ordinances. My happiness is inexplicable. With this great opportunity, I'm so profoundly indebted to our Lord. Thank you Lord for I know the truth, the truthfulness of the Gospel, the authority of the priesthood, and the restoration of The Church of Jesus Christ for the Latter-day Saints. Thank you also Lord for your living prophet who receives inspiration and revelation to guide and lead us towards our exaltation. 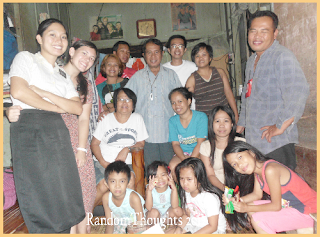 Congratulations to you and your family for having a good relationship to the Lord.I remember how i was converted from being a catholic to a Christian, I know from then on that my life will change a lot for embracing the Lord.And true enough ,i found happiness in the my decision.i am the only born again christian in the family(parents,siblings) but i know that my kids are following my religious faith and beliefs. It's great that you are so spiritually blessed. I admire people who stand by their faith and lend an extra hand to make the world a better place. Wow Bro. Gil, 32 years in the Church.congratulations and keep the faith alive with all the things you do! I've been an LDS for 25 years last April 11 and grateful for that decision to join the church with the whole family. And oh good to know that it was Art Tolentino who baptized you. I know him as we work together at the Church Office. You have a beautiful family sir Gil.. united by faith and God's love. I can see that you're such an inspiration as a father, leader & a servant of God. Congratulations for your 32 yrs continued commitment! Wow, this is like a journey to the past... God bless you and your family..
Congratulations sir Gil..its great to read post like this sharing inspiring stories about their relationship with God and family.. more blessings and keep on inspiring sir Gil! good for you! congratulations. I hope your faith brings you more meaning and blessings. 32 years of serving the Lord. No wonder you are blessed tremendously Sir Gil.